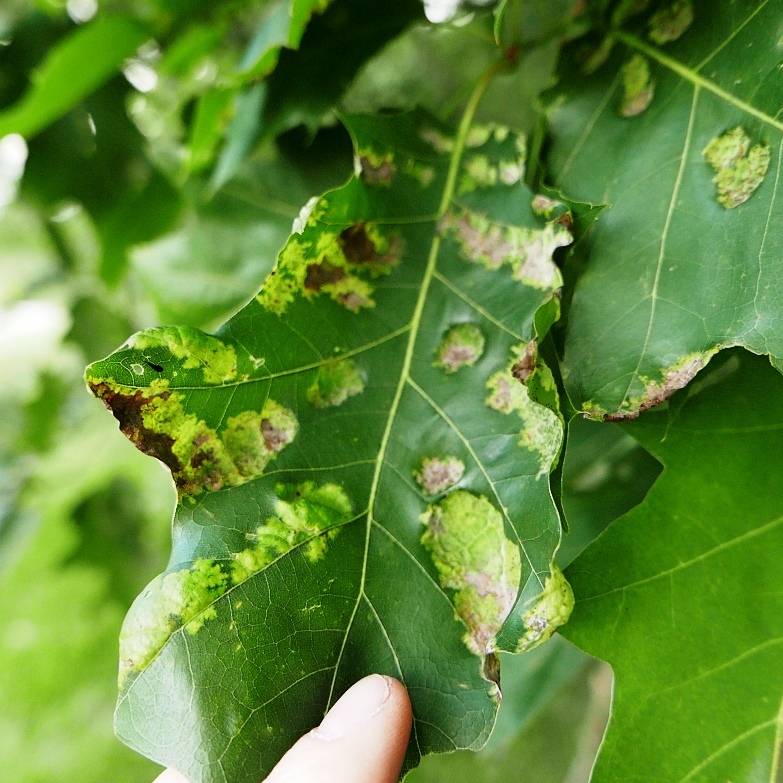 Oak leaf blister, a fungal disease caused by Taphrina caerulescens, is widespread this year on a range of oak species, both in the white oak and red oak groups. Symptoms include raised, blistered, greenish-yellow spots on upper leaf surfaces and darker, corresponding sunken spots on lower leaf surfaces, though sometimes the raised and sunken aspects may be obscured. Fungal growth can sometimes be seen on undersurfaces of leaves. The fungus spreads by spores that are produced in early spring on twigs and buds infected the previous mid to late spring. This year’s spores are then splashed and blown to new sites on leaves, twigs and buds, only infecting plants once per season. Incidence of the disease is favored by cool, wet spring conditions, which were common this year. The disease is rarely of importance to trees and controls are not generally recommended; if fungicides are used, for example in the nursery, they should be applied before bud break in early spring. The oak blister fungus is related to the peach leaf curl fungus, Taphrina deformans, important to orchardists, and the plum pockets fungus. For our final pictures with this bygl-alert, note the occurrence of the insect-induced jumping oak galls within and without oak leaf blister lesions. Nature ever fascinates.